In a small bowl, combine taco sauce, water, half of the package of taco seasoning mix and chili powder; Stir until combined; set aside. In another bowl, mix refried beans and salsa; set aside. 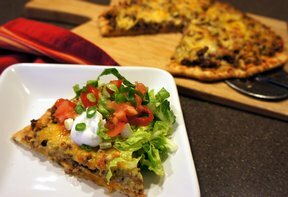 In a large skillet, cook ground beef and onion until evenly brown; drain. Season with the remaining taco seasoning and remaining water. Simmer a few minutes, then remove from heat. 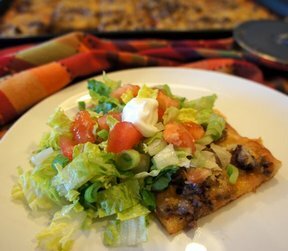 Spread a layer of the bean mixture on the pizza crust, then a layer of the taco sauce mixture. Sprinkle with seasoned beef. Top with cheddar cheese. 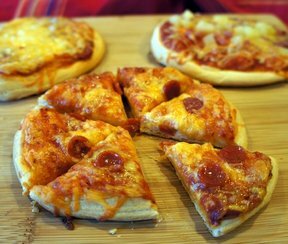 Bake in preheated oven for 10 to 15 minutes, or until crust is golden brown and cheese is melted. Remove from oven. Top with lettuce and any additional toppings you prefer. "My kids loved this meal. 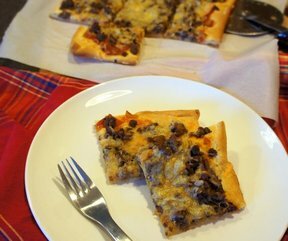 It's perfect for weeknights and everybody topped their slice with what they wanted."